Having started life as a red Ferrari 330 GT 2+2 with gorgeous Pininfarina bodywork, this chassis was delivered to its first owner in the U.S. through Luigi Chinetti’s dealer looking very different than it does now. When that first owner traded in the 1965 model two years in, Chinetti didn’t want just a regular used model sitting on his showroom floor. Working with an American pen, Bob Peak, new coachwork was drawn up for Carrozzeria Alfredo Vignale to turn into metal. The truth isn’t absolutely clear here, but it is believed that this car was the last Vignale-bodied Ferrari to ever be built. The coachwork house had quite a history with Ferrari, crafting incredible bodies for their cars, particularly across the 1950s. This may not have been their most beautiful work, with some strangeness to its proportions, but being potentially the last one built certainly adds to the vehicle’s cachet. With proper room for four adults, including a full tan leather bucket for each occupant, this Ferrari was re-crafted into an incredible touring machine. Vignale and Chinetti were so proud of the work they’d accomplished together, the car was shown at the 50th Turin Salone dell’Automobile in late 1968 following its completion. It sat in stark juxtaposition to the sleek four-seat Maserati Indy prototype also in Vignale’s booth. Retaining the stock—though not original—300-horsepower triple-Weber carbureted V12 up front, and 5-speed manual transmission, this Fezza Family Truckster still has all of the fizz it left the factory with. In fact, Luigi Chinetti liked the finished product so much, he kept it as his personal car for a number of years following the rebody. Chinetti sold the car in the mid-1970s to a local, who continued to use the car as regular weekend ride. The Ferrari stayed on the East Coast of the U.S. through the early 1990s, bouncing among a few owners, before being sold off to Jean-Claude Paturau, a collector in France. Paturau commissioned the rare Ferrari’s restoration. 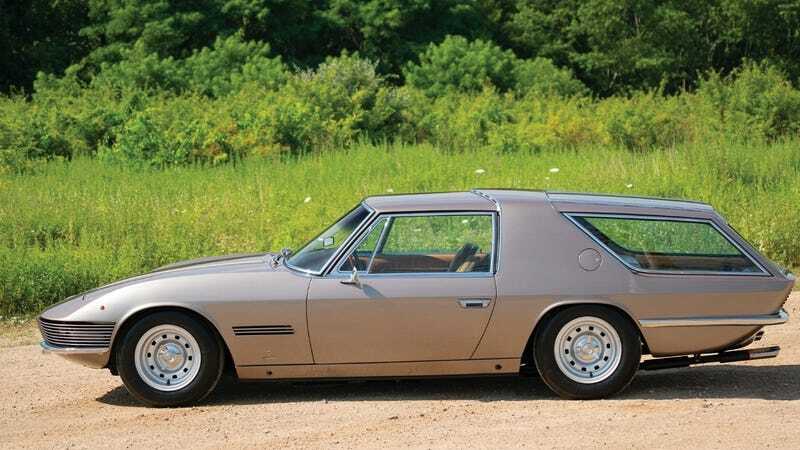 For the next decade the Frenchman showed the Italian shooting brake at a number of prestigious concours throughout Europe. In 2011 the car ended up under the care of Jay Kay, front man of Jamiroquai, and avid car man. In 2015 it ended up selling back to the U.S., and it was given a full-repaint in 2017. If you’re looking for the perfect intersection of vintage collectible rarity and family usability, this Ferrari is for you. Even as strange as this Vignale looks, it’s a right sight better looking than the godawful ugly GTC4Lusso shooting brake the company will sell you today. Though, to be fair, it’s entirely possible that this ‘60s version will be quite a bit more expensive. If you simply must have it, this Vignale bodied family Ferrari will be offered during RM Sotheby’s Petersen Automotive Museum Auction on December 8th (one week after Radwood at the very same location) in Los Angeles.